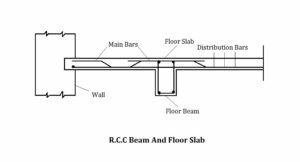 For larger span and excessive loading situations or in circumstances where intermediate walls are not used RCC beam and slab construction is suitably adopted to decrease the span of the floor slab. In the floor system, the beams stay as intermediate walls and the floor is outlined as continuous slab. The beams in this manner utilized are called T-beams because a part of the floor slab helps to resist the compression created by the beams. The anticipatory portion of the beam underneath the slab is known as rib of the beam. In framed structures, the floor is normally supported on the primary and secondary beams. The floor slab is rested continuously over the secondary beams which are framed into and supported by the primary beams. Also Read – Reinforcement Details In one Way slab.